Internet's development is massive, all around the world, in any field, any direction or activity: e-mail, e-commerce, data, photos, videos exchanges, news and forums. Willing a regulation of those billions of electronic communications, of all kinds, the states have made legal revolutions, signing a huge number of international conventions and agreements, about intellectual property, commerce, electronic signature, cyber criminality, data protection, patent. The states have, also, adopted through Parliament, many European and national laws. In despite of this big amount of laws, internet goes on, playing with frontiers and creating conflicts, because of state's legal sovereignty and territorial laws. This book publishes the «Acts» of the international colloquium on «Internet International Law» organized by the University of Paris-I Pantheon Sorbonne, the French Ministry of Justice and Arpeje association. It systematically studies every aspect of internet international law, asking all the questions and bringing solutions. 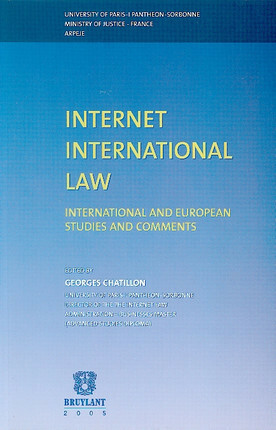 This book is a real «Internet International Law Treaty» and without equivalence today. The lawyers will find the problematics and the reasonings that they need for advising, arguing, thinking. The judges, policemen, traders, buyers, authors and inventors will recognize their problems and get legal solutions. The book authors, coming from the whole world, are all recognized experts: university professors, advocates, practicians, representatives of international and non governmental organizations. The book answers to internet law crisis at the international level, bringing precise and concrete responses, and making very legal propositions.